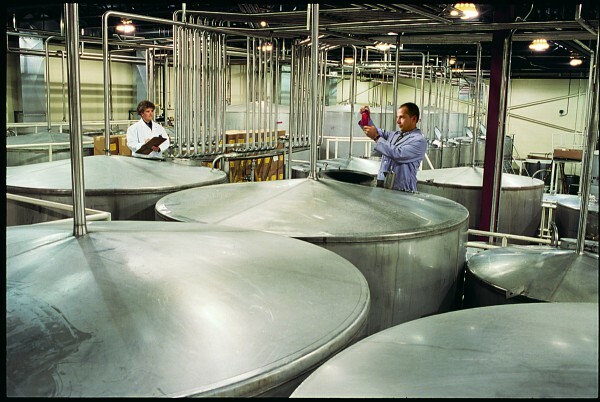 Workers at White Rock Distilleries in Lewiston inspect some of their product. LEWISTON, Maine — Beam Inc., maker of Jim Beam bourbon, announced on Thursday that it will shut down production at its Lewiston facility and shift production of Pinnacle Vodka and Calico Jack Rum to a facility in Kentucky. The 160 employees who work at Beam’s plant in Lewiston will lose their jobs, Paula Erickson, a spokeswoman for Beam, told the Bangor Daily News on Thursday. Employees in Lewiston were told of the decision on Thursday afternoon, Erickson said. All production of Pinnacle and Calico Jack will be shifted to a Beam facility in Frankfort, Ky., but the changes won’t be immediate. The consolidation will take place over the next 15 months and be complete by April 2014, she said. “We wanted to give the workforce as much advance notice as possible,” she said. Consolidating production in Frankfort will be more efficient and save the company money, she said. Beam acquired the Pinnacle and Calico Jack brands from White Rock Distilleries in April of last year, Erickson said. At the time, Erickson told the BDN there were 180 employees at the Lewiston facility. With nearly 3 million cases produced a year, Pinnacle by far is the biggest brand coming out of Lewiston, she said. She didn’t immediately know how many cases of Calico Jack was produced in Lewiston. In a statement, Ian Gourlay, Beam’s senior vice president of global operations and supply chain, said the decision to shift production from Maine to Kentucky was “a logical step,” and that it is in no way a reflection of the “dedication and hard work” of Beam’s employees in Lewiston. Erickson said Beam will be looking to sell the Lewiston facility. The news is the second blow to Lewiston this week. On Tuesday, Geiger announced it was shutting down its manufacturing business in Lewiston and laying off 75. Correction: An earlier version of this article stated Beam employs 100 people in Lewiston. The company actually employs 160.